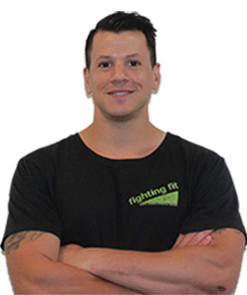 Daniel Russo is the proud co-owner and co-founder of Fighting Fit PT. After years of experience working in the fitness industry, Daniel set up Fighting Fit in 2011 with a clear vision to provide the very best training facility in the Melbourne area. Daniel cares passionately about his clients, and is committed to doing everything he can to help people reach their fitness goals. Daniel’s integrated approach to training, nutrition, and general fitness leaves nothing to chance. Whether you want to lose weight, develop your strength, or change your attitude to exercise and diet, Daniel takes great pride in finding a unique solution for each client. He is proud of his achievements over the years and looks forward to helping more people reach their fitness goals in the years ahead. Since developing Fighting Fit PT, Daniel has helped countless individuals and groups in their journeys towards health and fitness, including corporate organisations, school groups, professional athletes, and kids. His extensive experience and never-say-die attitude have made him a favourite trainer in the Preston area, which is one of the reasons why Fighting Fit continues to grow and evolve. Along with his dedication to health and fitness, Daniel understands the importance of a safe and comfortable exercise space in which people feel at home. Before becoming a personal trainer and starting Fighting Fit in 2011, Daniel worked as a manager in a criminal law firm in Melbourne’s CBD. His experience in criminal law helped to open his mind and expose him to a wide variety of different people. While the legal and fitness industries are pretty far apart, Daniel’s time in the city saw him develop great people skills and a sense of professionalism that he brings to Fighting Fit every day. Along with his legal career, Daniel was a passionate Taekwondo instructor at Team Carlo Taekwondo. While injuries eventually saw his fighting career end, Daniel won a number of state and national championships in Taekwondo before moving over to personal training. Daniel credits a lot of his drive and motivation to Taekwondo competition and instructing, which is when he learned to love the spark in people’s eyes as he coached them towards success. Daniel was a member of the Victorian State Taekwondo Team and Victorian State High Performance Training Team. After competing and instructing Taekwondo, Daniel looked for new ways to share his love and passion of fitness and self-improvement. Daniel has trained people for the Tough Mudder Challenge and Colour Run, and supporting people in their training for numerous marathons and fitness events. Daniel has also tried his hand in philanthropy, raising and donating funds to research organisations such as Mother’s Day Classic and the Good Friday Appeal. When it comes to fitness, Daniel adopts a no-nonsense approach based on structured training programs, nutritional supplements, and creative hard work. At the end of the day, he is here to help you push your limits and exceed your expectations.